Brooklyn, NY - Former Mayor Michael Bloomberg may have had ambitious goals when he announced his intention to plant one million trees in New York City by the year 2017, but some Brooklyn residents are objecting to the forced beautification of their streets according to a local elected official. Assemblyman Dov Hikind spoke out today against the mandatory project, saying that while it may have environmental and aesthetic benefits, it forces homeowners to deal with a host of issues, including raking leaves, rambunctious tree roots that can permanently damage sidewalks and falling tree limbs. 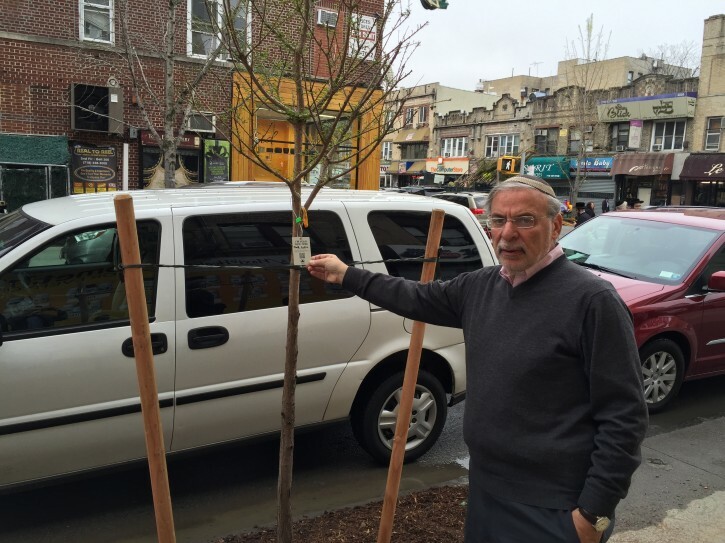 Hikind said that homeowners should have the option of refusing a tree in front of their home and asked Mitchell Silver, commissioner of the New York City Department of Parks and Recreation to change city policy and allow homeowners to refuse a tree. “I am for trees, but I am against forcing homeowners to have one in front of their house,” said Hikind. Free trees had previously been available from the city on a first come first serve basis, but under the MillionTreesNYC project, many homeowners were not aware that they were about to receive a tree until their sidewalks were marked and cut. Thats right Dov. Why beautify a ghetto like BP? It will only get in the way of all the garbage on the streets. How about mandatory garbage cans for all homeowners. As a person who has lived in BP for years all i can say is thats its a disgusting place to live. Its a pig sty!! Thank god i moved out. Is this how bnei torah live? Really Dov.you have nothing but trees to complain about? Under your watch BP has turned into an embarrasement! I love trees and the benefits the trees offer such as shade etc, however I can say firsthand that I have some massive trees on my block, the city barely prunes them. Lately some huge branches have fallen onto cars, Gd forbid if one these branches fall onto a person. I agree that the homeowner should have the option of refusing the tree. And the city should only plant trees that are known not to become too big in size. The roots eventually damage sidewalks and sewer lines. Planting fruit and berry trees is really bothersome. Ok to sll you haters out there this time he is right this past summer on my block we had to spend over $26,000 to repair cement that was cracked from city roots since we live in a condo and for some corrupt reason the city wont reimburse condos we had to spend it ourselves!! They came back erev yom tov again to replant when we complained they told us not to touch it because we would grt fined $20000!!!. David greenfield office told us the park has a no refusal policy and could care less about our damadge so please mr. Hikind if you can do anything please help us. Dov is a total fool! Why didn't he do anything about the chutzpah of stores placing containers all over Boro Park? not to mention they crack the sidewalk. guess whos responsible for that? its not the city. some of these things have large metal baricades and brick foundations that take up a nice chunk of the block. can u imagine the sakuna these things will cause in heavy snows when there not visible. these are a hazard for strollers and the elderly. Even if you call the city they take their sweet time to come. Chas v'shalom that if something does happen they will come. You can ask them why didn't you come when I called you???? In my local community, a homeowner's association in a certain neighborhood, also came up with the brilliant idea of planting trees in front of the homes of residents, without their approval, or permission. As a result, some of the young trees which were planted, did not survive the winter. Others were blown over by high winds, and obstructed the street. I had two trees planted in front of my house, by our local government. I asked the city not to plant the first one, but they did so anyway. Both the original, and its replacement (in spite of my watering them, as instructed), did not survive. It was a hassle to get the local city government to remove the dead trees. Without my permission, they tried to come back a third time, and plant another tree. I told them not to do so, and they left. They actually had the chutzpah to send me a note, that they were going to attempt to plant another tree for the fourth time. This time, I sent a letter to the head of the agency who handled the tree planting. I was assured that I was removed from their list, and there would not be any more trees planted. In summary, cities should not force new trees down the throats of homeowners. Dov is right, this is another of Empreror Bloomberg unwise "initiaitives" like traffic islands in the middle of major thoughofares that stop ambulances from going by. abolish the Parks Dept. You have to file notice with the city and intent to sue for damages and negligence if they don't prune the trees on a regular (every 3 years basis) and a branch crashes into your property. Your home insurance doesn't cover damage to sidewalks or sewer lines. If they can't prove that they pruned then you sue them for damages. If enough multi-million dollar suits are brought, the city will reconsider. If it works for people falsely accused and criminals, why not us? As far as the dirt on the sidewalks, have you looked at your water filter recently? Speaking of dirt, dina d'malcusa, dina - oh what a concept. Plant them in Seagate we have no trees after Sandy. Why don't they just put up plastic trees? In fact, all trees should be made of plastic. I like to drive around New Square and Kiryas Joel to look at the beautiful landscaping. Not to mention the trees with those berries, which emit a foul odor then falling off the branches? These trees are planted without permission of the landlord,and then the landlord is responsible to fix the sidewalks !!! What a joke these trees are.They mess up sewer and gas lines and cause millions in damages,and there is no recourse?? A few years ago the city was fining everyone that had a cracked sidewalk or chipped.. giving the homeowner a certain time to do it in or they would do it for you at double the price. It cost thousands of dollars to repair. Now they want to dig up that cement to put a tree and don't care what you want it or not. The placement is right next to my gas line and water main pipe. Just as the picture shows, it is placed so when you park your door hits the tree. I sit in front of my home, a six family building with my granddaughters watching one dog after another taking a pee or poop in front of us. Now that is a pretty site. I fought hard to stop the process but lost. It takes over most of the sidewalk and people have to continuously yield to each other. Taxpayers should have the right to refuse such a pleasure..